Lucy makes yet another ridiculous promise to her children, this time that she will get tickets to The Danny Kaye Show. She hunts Danny Kaye down at a restaurant posing as a model, and destroys his lunch meeting by making him wear all the courses. Then she follows him to his hotel in a relentless pursuit for tickets. Finally, Danny arranges for the Carmichaels to be extras in a crowd scene; all she has to do is blend into the background. This is something Lucy is incapable of doing. 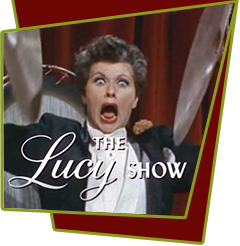 Special Notes: When Lucy smashes Danny Kaye's cigar into his face, he says, "I'm just lucky she didn't set fire to my nose." In the famous I Love Lucy episode L.A. at Last! Lucy sets fire to her own nose while bothering William Holden. She also dumps a tray of food on Kaye's head at a restaurant just as she'd done to Holden in that same episode. In another reference to the previous series, Lucy tells Danny she can play "Glow Worm" on her saxophone. She'd croaked out that tune many times as Lucy Ricardo.